I’m running in the elections because the #RedForEd rebellions that have swept the nation have shown that educators who organize a strong network of rank and file union members can win impressive changes in their unions and school districts. The fightback in Washington State, LA, Oakland, West Virginia and Arizona have inspired me to build that kind of organization here in New York City. I became an educator straight out of college because it was a stable job in the midst of a recession. I saw many of the folks I started with not last through their first years, and realized that we needed a stronger union to defend untenured teachers. I’ve been working as a math teacher for 15 years now and currently teach at a bilingual school for Latin American immigrants where I teach Algebra II and Robotics. The omnipresent (and unaddressed) segregation of the public schools where I grew up had a profound political effect on me. Now that I teach in the most segregated school system in the country, the impacts of race and class on the education of our students is to stark to be ignored – and must therefore be central to any project of changing education for the better. We have to make #BlackLivesMatter in school, too. The vision of MORE is shaped by the ongoing fights of educator-organizers across the country who galvanized their coworkers, students, parents and neighbors. It couldn’t be a starker contrast to the strategy put forward by Mulgrew and co. in the UFT leadership, who rely on their cozy relationship with politicians like Andrew Cuomo to get things done in Albany. This means that we don’t fight around the things that we need in our classrooms – like lower class sizes, freedom from high-stakes testing, or defense against autocratic administrators. And, as a result the majority of union members don’t see the UFT as a vehicle for change in their workplace. We have to organize to change that. The 2019 UFT elections are crucial moment to reach out to our coworkers and communities and convince them of the need for knitting together educators and parents who want to see change into a common network of activists. De Blasio and Cuomo have already started talking about looming budget cuts – the current economic expansion will not last forever. We need to build a strong network now in order to be prepared to fight for stronger funding for our students and our jobs going forward. I have been a guidance counselor for ten years. I have always believed in the power and promise of public education, a promise gone unfulfilled for so many. Every student has a right to education but the type of education received depends on whether teachers, students and parents have ownership over their schools. I became a guidance counselor at a time when the profession was changing from academic advisement to an increased awareness that social emotional health is critical to academic success. More counselors in schools means that access to social emotional learning also becomes a right for all students. The daily trauma and oppression faced my most students cannot be overcome merely through academic opportunity, it must be addressed through increased mental health supports in schools, access to reproductive healthcare in schools and more social workers working with families. The most challenging part of my job is witnessing the suffering that students and parents endure with the current punitive model imposed on most public schools. Students and parents need support and community, not suspensions and risk of arrest. I believe that there are opportunities now to increase restorative justice approaches and to fight for more counselors and less cops in schools. Los Angeles teachers just led and won a successful strike that addressed teacher working conditions along with demands to end random searches of students at the hands of the police. For far too long, the interests of parents, students and teachers have been pitted against each other within schools. I am running with the MORE caucus because I believe that needs to change. And I believe that with the current teacher’s rebellion, it is already beginning to change. 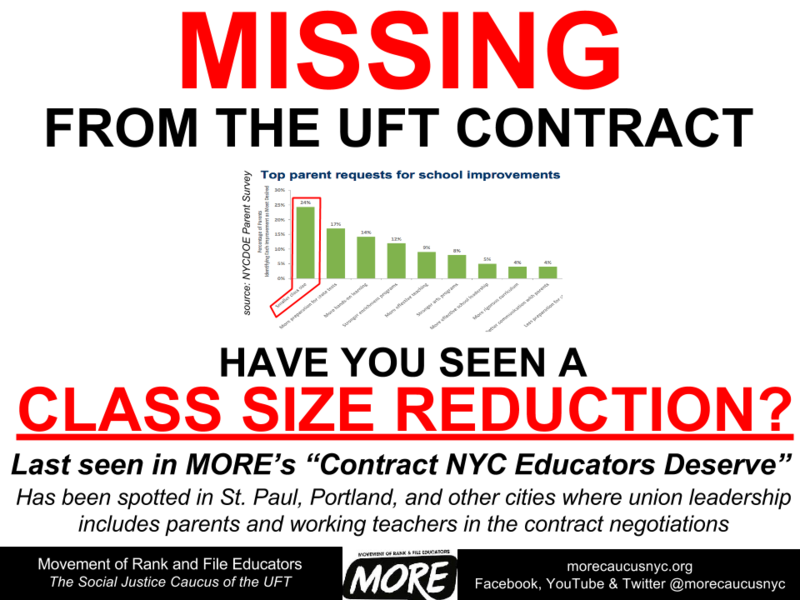 The current leadership in the UFT does not have the courage to see this struggle through. They have been in power for decades and are resistant to change at a time when change is needed most. There are currently more school safety agents in public schools than counselors. These priorities must change immediately and I am excited to be part of a social justice caucus working with parents and students to make this a reality. UFT President Michael Mulgrew likes to tell union delegates that it’s either money or class size, not both… But neither? MORE members take action against over-testing! 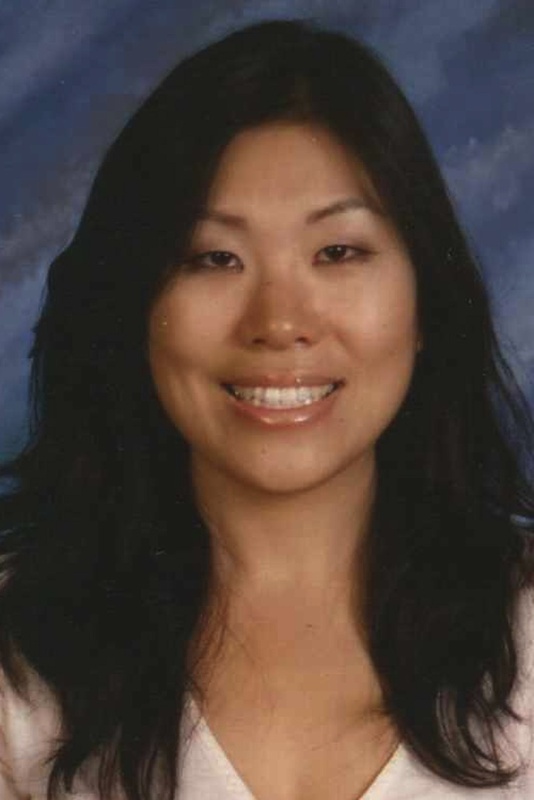 Jia Lee, MORE candidate and teacher at the Earth School, is one of the conscientious objectors who refuses to administer the NY State Test this year. New York City public school students in grades 3-8 are currently taking the controversial New York State (NYS) Common Core tests. MORE opposes the administration of these corporate-created high-stakes exams, and we stand in support of parents who are refusing to have their child(ren) take the test, and in support of those teachers who are refusing to administer them. This rally and march is part of the national Testing Resistance & Reform Spring campaign. We aim to support the efforts of parents, teachers and community members to have public schools that work for the community. Join us on May 17, 2014 in NYC! Solidarity with St. Paul Teachers! Teachers in St. Paul, MN are preparing for a strike authorization vote on February 24th. The union is holding informational meetings in the lead up to the vote. If the strike is authorized, the union is required to give 10 days notice before calling a strike. The strength and unity of the membership was evident on January 30th when “walk-ins” were organized at 55 of 62 sites with over 2500 of the city’s 3200 members participating along with parents, on one of the snowiest mornings of the year. The St. Paul Federation of Teachers has done extensive outreach to parents and other community members for months, holding open meetings, and even open negotiation sessions, to discuss contract demands and involve teachers, parents and community members in shaping their demands. As in Chicago, the union has put forth its own blueprint for “The Schools St. Paul’s Children Deserve.” As a result, the SPFT has gained immense support. Parents recently helped to start a Facebook page called “I Stand with SPFT” that quickly grew to 900 members. On February 18th, hundreds of teachers and community members rallied at a school board meeting and many parents provided testimony in support of the teachers’ demands. The Saint Paul Federation of Teachers is fighting for reduced class size, increased staffing (more nurses, librarians, social workers and counselors), access to pre-k for ALL students, and less standardized testing to allow for more genuine teaching. MORE calls on all UFT members to stand in solidarity with the St.Paul teachers and students by following their struggle and taking action. You can also follow the St. Paul Federation of Teachers on Facebook, join the “I Stand with SPFT” page and post messages of solidarity to show your support. In addition, you can call the Superintendent and school board members of St. Paul and urge them to come to an agreement with the St. Paul Federation of Teachers to lower class sizes, increase staffing and provide universal access to Pre-K.